If you’d like to hear about new book releases and other events, you can sign up for updates and Louise will send you an e-mail when her next book is due. (Your e-mail will never be used for any other marketing and this is a completely free service). Hi, brilliant books, can’t wait for book 3! Lovely to have books set in the north, for a change, written by a geordie. Amazing books! Hello! Just read all 3 DCI Ryan books back to back and loved them! Do you have a release date yet for Angel? I have just finished reading my third LJR- Heavenfield. I really enjoyed them all. Despite the excellent plots I have the additonal interest in now living in Northumberland. After years of holidaying here, we have now retired to this stunning county! So looking forward to Angel. Last month my brother Steve gave me your first 2 novels as a gift. I believe you met him at the Greenwich writers group so I am lucky to have signed copies too. 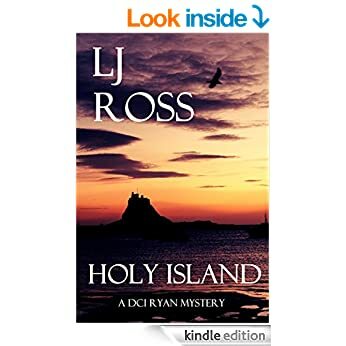 I have just finished Holy Island, which I thoroughly enjoyed. I thought the pace and style of writing was good and could see it appealing to a wide audience. I am looking forward to starting the next instalment in Sycamore Gap and finding out what Ryan does next and whether the story follows on. I thought I would ‘check you out ‘ online and glad I did as I now see there are 2 more novels published in the series – great! Thanks again , the decision to change career seems to be working for you! Thanks very much for getting in touch! I’m delighted that you enjoyed Holy Island and hope you find the others in the series equally enjoyable! It was very nice to meet your brother at the Greenwich Writers’ Group – I wish him every success with his own writing! Have just read High Force and all I can say is WOW, you really know how to build up tension. Cannot wait for the next book. DCI Ryan is wonderful. I have just finished Dark Skies – having received the first two for Christmas I was hooked and had to get the rest myself. I have absolutely loved reading about DCI Ryan and his team – I am big fan of crime novels and adore Northumberland, so it is my ideal escape! There are so many nuances in your books and they are absolutely engrossing. When is the next one out?